NORTA2012, a VonDullen streetcar built in 2003, inbound on the Loyola-UPT Line. The Loyola-UPT runs from the Union Passenger Terminal (UPT), at Earhart Blvd and Loyola Ave. It travels inbound on Loyola to Canal Street, where it turns toward the river, to the foot of Canal. There, the line travels along the Riverfront to the French Market Terminal at Esplanade Avenue. The VonDullen streetcars were built initially for the return of the Canal Streetcar line, in 2004. All of the VonDullens received significant damage during Hurricane Katrina, when six-plus feet of water inundated the Canal Barn, behind the A. Phillip Randolph bus facility on Canal Street. The propulsion, trucks, and electronics of the cars were removed, repaired and/or rebuilt, interiors replaced, and the steel bodies given a fresh coat of red paint. They’re back, serving Canal and Loyola daily. 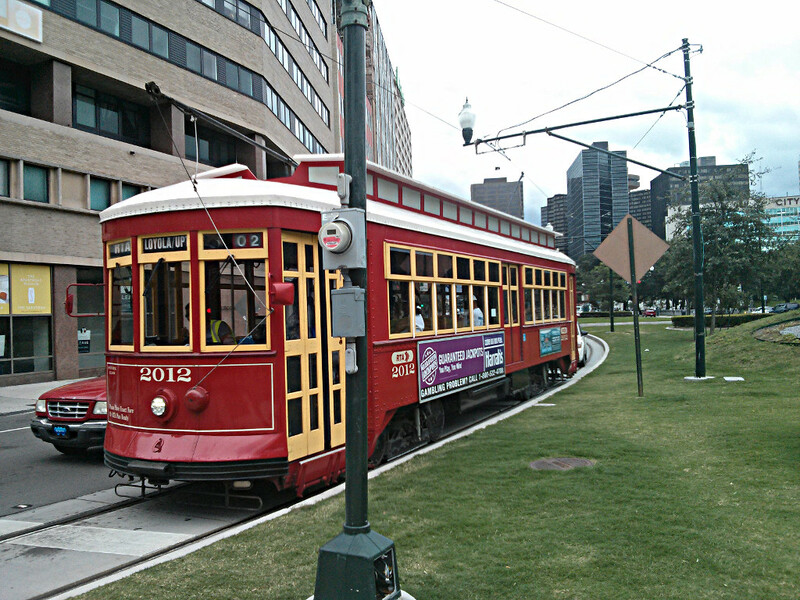 The VonDullens (named after their lead designer and former head of the NORTA Rail Department, Elmer VonDullen) are patterned after the arch roof design of the 1915 400-series and 1923 800/900 series streetcars acquired by New Orleans Railway and Light Co, and New Orleans Public Service, Inc. (NOPSI). Thirty-five of the 900-series, 1923-vintage arch roofs continue to operate on the St. Charles line.